Here we are, back again after a month's respite (did you miss me? 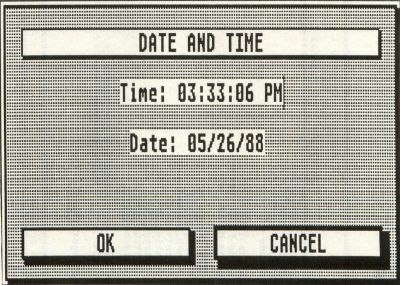 ), and I think that this time around we'll tackle a subject that we've managed to avoid these last 2 1/2 years—the Atari ST's real-time clock. Actually, "avoid" probably isn't a good word to use here, since reading and setting the ST's clock is really not very hard. You just need to become proficient with handling data in a bitwise fashion rather than as words or bytes. And as we'll soon see, attaining those skills will not require an inordinate amount of effort, and what you'll learn will be a valuable addition to your future C programming projects. But first you should get this month's sample program up and running, and that involves a little more work than usual. You're going to need to create the dialog box shown in Figure 1. There are two ways you can do this. The first is to type in Listing 3 with ST BASIC (make sure you check your typing with ST Check), and then run it. The program will create the necessary resource file for you. The other way to produce the dialog box is to use a resource construction program to create it for yourself. It's a fairly simple dialog box, so this should be an easy task. That's all you need to know to reproduce the dialog box shown in Figure 1 (except that you must name the .RSC file DATE.RSC). If all of this sounds confusing to you, either review the C-manship columns on dialog boxes (Issues 13 and 14) or use Listing 3 to create your resource file. Now that you've created your resource file, you may type in Listing 1 and compile it. If you used the ST BASIC program to create your resource file, you must also type in Listing 2 before you try to compile the program. Save this listing to disk as DATE.H. Now run the program. If you've got the resource file in the same directory as the program, you'll see the dialog box shown in Figure 1. (If you're missing your resource file, the program will warn you, and then return to the Desktop.) The time and date shown in the dialog box are the current settings of your system clock. If you'd like to reset the clock, just edit the time and date strings and click on the OK button. If the strings you've entered are valid, the program will reset your system's clock and return to the Desktop. Otherwise you'll receive an error alert box, and you'll have to re-enter the information. If you're satisfied with the time as it is, click on the CANCEL button or simply press RETURN. Let's take a look at Listing 2 and see what's going on here. You should already be familiar with most of what we're doing in this program. For instance, we long ago discussed how to load a resource file and get a dialog box up on the screen. In case you've gotten a little rusty over the last few months, the program listing is commented so that you should be able to see what's being done. where date is an integer. The function Tgetdate() is defined in your osbind.h file as gemdos(0×2a) and returns all the information we need to figure out the current date. Piece of cake, right? Not quite. If your noodle is active today, you'll remember that our dialog box displays the date by month, day and year. However, the Tgetdate() call yielded us only one value. See a problem here? To simplify the process of storing and passing the system date, the people who designed your ST's operating system decided to cram all the information we need to extract the current month, day and year into a single integer; and if you're really on the ball today, you'll real ize that that means we're going to have to finagle some bits to separate the information we want from the information we don't care about. The system time returned from the Tgetdate() function is formatted in the following manner. Bits 0 to 4 (counting from right to left, remember) contain the day, bits 5 to 8 contain the month, and bits 9 to 15 contain the year since 1980, or, in other words, the current year minus 1980. Figure 2 illustrates this format. What we have to do is figure out a way to extract the day, month and year from the entire integer. Thank heavens for bitwise operations! We've already had experience with the bitwise AND and bitwise inclusive OR operators. The AND operator compares the bits of two values and places into the result a 1 in any position where both bits of the compared values are set and a 0 in every other case. This allows us to "mask" out the bits in a value that we're not interested in. We create a mask by setting the bits of the mask that correspond to the bits we wish to extract from the value of interest. Every other bit is turned off. The same problem would crop up if the low byte of num2 hadn't been cleared. A bitwise exclusive OR is similar except that the result will contain a 1 only in those positions where either one or the other bit is set. If both bits are set or both bits are cleared, the result will be a 0. The left-shift operator causes the bits in the first operand to be shifted to the left the number of times indicated by the second operand. The right-hand, emptied bits will be filled with zeroes. For instance, let's take a variable named num that contains the binary value 1011010110101101. If we were to perform the operation num<<5, the result would be 1011010110100000. The right-shift operator works much the same way, except that the emptied left-hand bits may or may not be zero-filled, depending on the machine and data type you're using. The rule is if the data type is unsigned, you are guaranteed to get a zero fill; otherwise, the left-hand bits may (depending on the machine) be filled with the value of the sign bit (the most significant bit). But what about the date? So here we are, finally back to the original problem of extracting the day, month and year from the single integer returned from the Tgetdate() call. Think about it for a minute. Have you got it figured out yet? No? Let me explain then. The information we need for the day is contained in bits 0 through 4, right? So, what we need to do is mask out bits 5 through 15. Then our result will contain only the value stored in the lower five bits—and that value is the current day. (Of course, whether or not this value matches your wall calendar depends on whether your system clock has been set properly.) Let's say the value returned from Tgetdate() is the one shown in Figure2. Figure 3a then illustrates the operations involved in extracting the day. Say! That was pretty easy, wasn't it. The next step is to get the month, but we run into a complication right away. If we were to just AND out the bits we weren't interested in, we'd end up with the value 0000000101100000 which translates to a decimal value of 352. Ouch! When's the last time you saw a month numbered 352 on your calendar? To get the value we really want, we have to move the four bits we're interested in to the right five places. Sounds to me like a good job for the right-shift operator to handle. These operations are illustrated in Figure 3b. Although Figure 3c doesn't show it, we have to remember to add 80 to the result because, as I mentioned before, the year returned from the Tgetdate() call is the year since 1980.
where time is an integer. Bits 0 through 4 of this value will contain the seconds divided by two, bits 5 through 10 will contain the minutes, and bits 11 through 15 will contain the hour. We can extract this information in the same way we calculated the date—by shifting the bits we're interested in all the way to the right, and then using a mask and the AND operation to clear the bits we're not interested in. Also, keep in mind that the value for the seconds is the number of seconds divided by two. This means that you must multiply times two the value for the seconds returned by the Tgettime() function. This also means that your ST's clock is only accurate to the nearest even second. Setting the system's time and date requires only that we reverse the process we used to get the time and date. Instead of using an AND operation, we'll be using the inclusive OR, and instead of shifting bits to the right, we'll be shifting them to the left. where the integer date uses the same bit format we learned about when we discussed the Tgetdate() call. These functions are defined in your osbind.h file. gives us a result of 0000010010000000 which is exactly what we want. To add the hours, we do the same sort of operation, only we'll be shifting the value for hours 11 places to the left. I might also add that it doesn't matter in what order we store the seconds, minutes and hours, as long as we follow the general procedure outlined above. If you look at Listing 1, you'll see that I started with the hours instead of the seconds. That about covers it. As you peruse this month's program, you may come across a couple of functions that aren't familiar to you. If so, just look them up in your manual. There's nothing complicated with any of them, and you should be easily able to figure out how everything in the sample program works.